Clyde Felix Cruz Jr. also known as Grandpa Clyde to some passed away at his residence in Charlotte on Saturday, February 24, 2018. Clyde was born August 10, 1935 in Charlotte to Felix and Paulita (Alaniz) Cruz. He proudly served in the United States Army after being drafted. He was an avid baseball player and enjoyed playing sports with his children, grandchildren and other family members. Clyde enjoyed watching all sports, especially the Dallas Cowboys. He loved his family most of all, he and Natalia would have celebrated their 60th wedding anniversary on June 11, 2018. 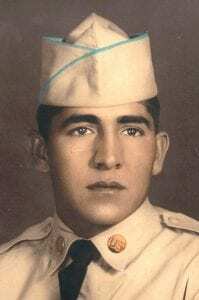 He is survived by his wife, Natalia Cruz and his children, Linda Garcia and husband Joe, Raul Cruz, Ricki Cruz and wife Melinda, Johnny Cruz, Roland Cruz and wife Leticia and Lisa Cruz Cardenaz; 18 grandchildren; 17 great grandchildren; sisters, Juanita Badillo, Fortunata Briseño, Teresa Adams and husband Bill, Angelita Anguiano and husband Juan, Michaela Benavidez and husband Luciano and Maria Salinas. He is also survived by his numerous nieces and nephews. He is preceded in death by his parents, Felix and Paulita (Alaniz) Cruz; brother, Jesus A. Cruz; sister, Guadalupe Cruz; nephews Rene Vega, Joey Mendoza, and Mario Badillo. Serving as pallbearers are Willie Joe Garcia, Tommy Joe Garcia, Adam Joseph Garcia, Thomas Jesus Cruz, Roland Felix Cruz, Jeremy Cardenaz, Anthony Salazar, Jacob Salazar. Serving as honorary pallbearers are Ricki Cruz, Johnny Rene Cruz, Roland Cruz, Raul Cruz, Joe Garcia. Visitation was held Tuesday, February 27, 2018 at Hurley Funeral Home in Pleasanton from 2 – 9 p.m. with a rosary recited at 7 p.m. A funeral Mass will be celebrated at St. Rose of Lima Catholic Church, 373 Madero in Charlotte at 10 a.m. Interment will follow in Charlotte Community Cemetery.